JAPAN does not kill whales for food or sport. 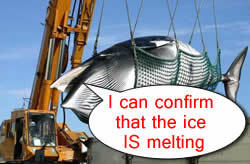 Japan investigates whales and the causes of whales by removing them from a watery environment by way of large hook. The team says its study offers the first evidence that global warming could be harming whales, because it restricts their food supplies. Whales are in danger! How do we know this? Because Japan has killed 4,500 whales since the late 1980s.